Our family’s experience with grief began on the morning of 27th December 2006 when my beautiful 15 year old son, Luke, died. 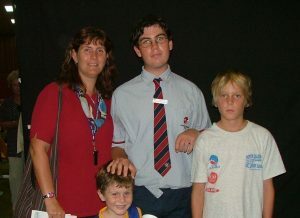 I am the mother of 3 boys and Luke was my eldest. Ben, my middle son, was 11 at that time and Samuel, my baby, was almost 5. Luke’s death was sudden and a complete shock to our family. I had no idea how I was going to survive let alone how I was going to assist my other 2 children to cope with the loss of their cherished older brother. For many years we just muddled through. We all tried counselling at various times but couldn’t quite find a connection. I realised quite early on that I needed to talk to other bereaved parents and could see that Samuel needed to talk to people too. Ben dealt with his grief very differently and still does today. He didn’t feel the need to talk about it in order to process it as Samuel and I did. As Samuel got older I began to worry about him as he was so mature due to his life experiences and didn’t connect very well with the children at school. He felt that no-one understood him or his loss. It was difficult for him to relate to the other children who stressed about everyday things. I changed careers and retrained as a social worker but found I couldn’t reach my son as he needed someone outside the family to talk to. By this stage I’d made friends with a lovely lady who had also experienced the loss of her son and she told me about Camp Magic. I sent off Samuel’s application and he was accepted for a camp in July 2017, he was 15. As we began our journey to Sydney Samuel began to worry about the camp and if he’d done the right thing by applying to attend. Ben made the journey from Queensland to drop Samuel off with me. We were very happy when we met his mentor and felt confident he would have a wonderful experience. When we arrived to collect him we were blown away with the beautiful ceremony at the end and when I heard that mentors were needed I decided this would be a fantastic way to honour Luke. I did my training and was a mentor for the September 2017 camp in Sydney. I felt a little nervous when I arrived but I needn’t have worried as everyone was so welcoming and helpful. My camper was a beautiful young girl who had lost her brother and was a delight to be with. The bravery those young girls showed in the talk time sessions had me in tears. I have not cried and laughed so much in a long time. I found that I truly gained more than I gave at the camp. The Saturday night bonfire ceremony was my absolute favourite part of the camp. I have since lost other dear family members and friends and it was a time to honour and think about them. The children were so brave and I loved how they comforted each other. What an amazing bond they had formed. Samuel has since attended a second camp and is now 17. He would like to attend one more camp before he turns 18 and then become a mentor himself. I am about to be a mentor at my second camp, in Canberra. What a wonderful organisation Feel The Magic is, it has helped our family and I am sure has touched the lives of many people. It is wonderful that Camp Magic is starting to have camps in other areas, we live in Queensland and can’t wait for the camps to commence there.